In a previous post I wrote about the first time I remember setting eyes on eighth-grader Bill (to whom I’ve now been married for almost 36 years). The year was 1967. The setting was the Des Moines Township school gym. Loel Diggs graduated from DMT in 1956. Around the time of my post, Loel sent to me the first three images below, all relating to DMT. In the title of the first image, “Hum-Po” refers to Humboldt County and Pocahontas County. The second photo is of Loel’s DMT letter. The third is of a sew-on patch Loel received. Loel received this letter while attending high school at the Des Moines Township school. 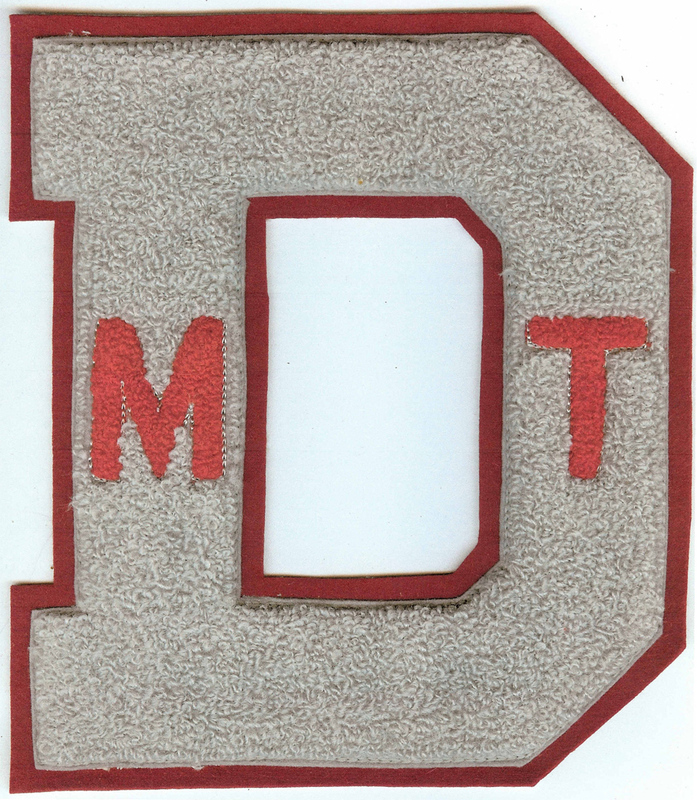 This is a sew-on patch Loel received while in high school. The following article* is from the February 5, 1955, Laurens Sun. 1955 was the year Loel was a junior in high school at DMT, so a year before the article at the top of this post was published. 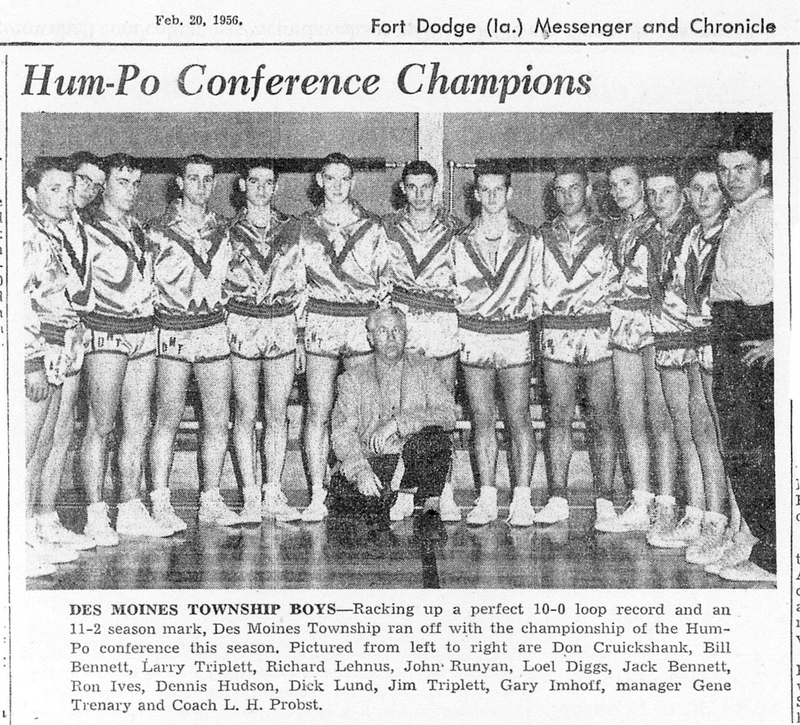 According to the two articles, Loel’s team’s conference record went from 7-7 in 1955 to a perfect 10-0 in 1956. Loel and I are wondering if perhaps between the 1955 season and 1956 season there became fewer teams in the conference, resulting in fewer conference games. *I found this article online via the Laurens (Iowa) Public Library’s web site. The Laurens library had the Laurens newspapers digitized in the same manner in which the Rolfe library is having 101 years of Rolfe newspapers digitized. The multi-step process of digitizing the Rolfe newspapers and getting them online is moving s-l-o-w-l-y. I guess the saying “A watched pot never boils,” is fitting here. One thing for sure…the wait will be worth it. This entry was posted on July 8, 2011 at 9:00 am and is filed under Uncategorized. You can follow any responses to this entry through the RSS 2.0 feed. You can skip to the end and leave a response. Pinging is currently not allowed. 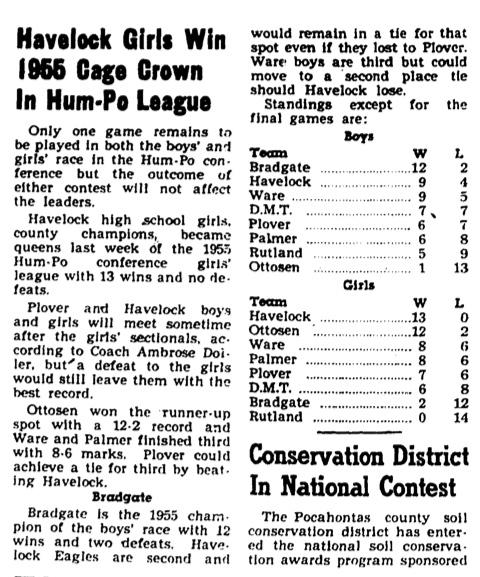 Basketball must have been really good at DMT during the 1955-1956 school year. I’ve been told that the DMT junior high boys BB team won the county tournament that year.